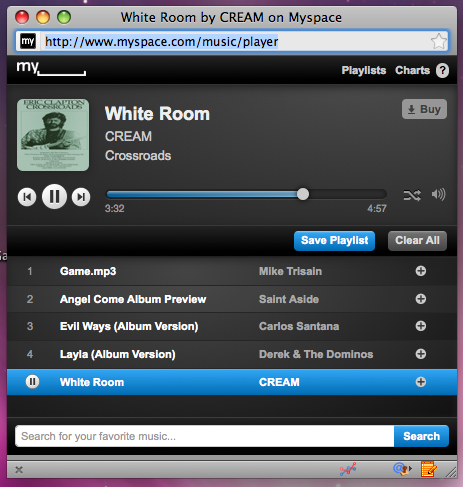 One of the first and most popular social networks at the time, Myspace (now under new ownership and management) is trying to make a comeback using music as the tool or bait to lure the community back in. Really? Will “The Largest Library of FREE Music on the WEB” do it? When was the last time you checked into Myspace, added a friend, or updated your profile? Can Myspace make a comeback regardless of the bait they use? 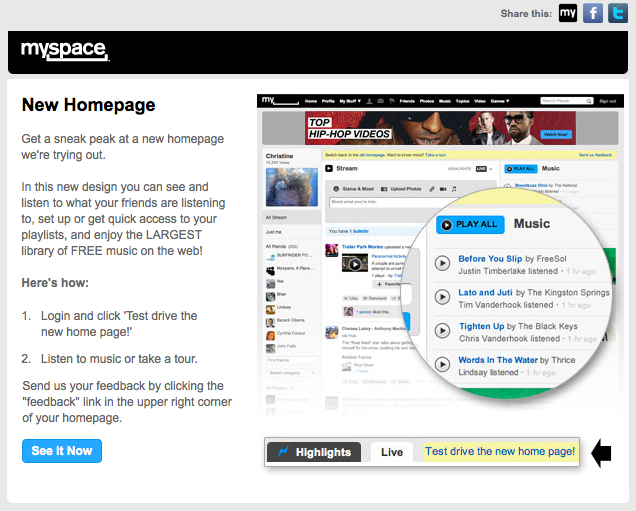 If you were the new owner of Myspace.com, what would you add to the site and what tools would you implement to bring it back to life? With social media sites like Facebook, Twitter, Ning, Google +, and many others evolving online today, how will Myspace stay in the SMM game? I’ll quietly confess, I’m headed over to MYSPACE now to see what changes they’ve made and to check out this Largest Library of FREE Music on the WEB. Honestly, I haven’t been there in 3 months and if this is just some ploy to get an increase in traffic, it might end up being my last visit. All that to say this ~ Could this happen to any of the other existing or new social networks? Could this same thing happen to Facebook or Google + one day? If you would have asked Myspace members 4 years ago what will become of the site, they would have said no way MySpace will ever lose momentum and members! So what is it that caused their demise and couldn’t this happen to others? If so, who will be next? Just some food for thought today….. I am really inspired together with your writing abilities and also with the format in your weblog. Is that this a paid topic or did you customize it your self? Anyway stay up the excellent high quality writing, it is rare to see a nice blog like this one today..